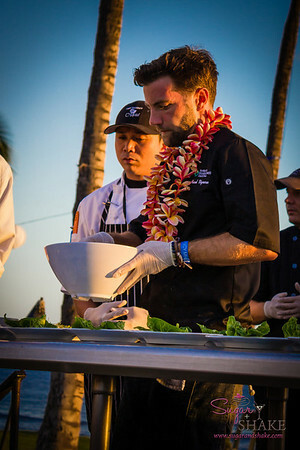 This year’s Kā‘anapali Fresh weekend food event culminated in the opening event for the Hawai‘i Food & Wine Festival. We got to enjoy several days of #KFRESH13 fun as well as the Mālama Maui #HFWF13 dinner. 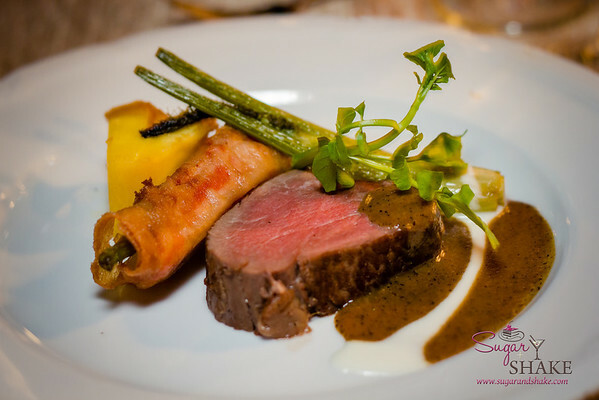 I’ll be writing more about our Kā‘anapali Fresh weekend later, but I wanted to get this quick little post up to give you a taste of the upcoming Hawai‘i Food & Wine Festival. 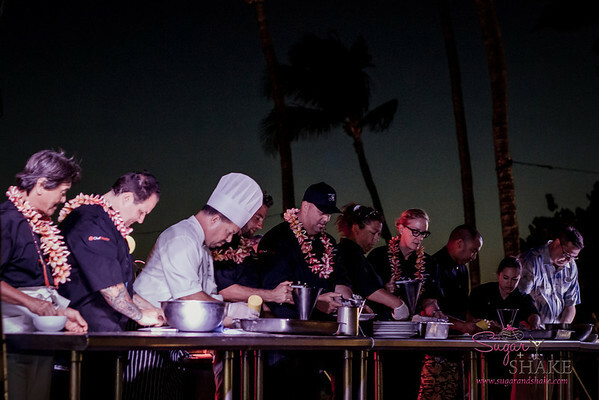 #HFWF13 kicks off on O‘ahu tomorrow night, starting with the Under the Modern Moon: Morimoto & Friends event at the Modern Honolulu hotel. This event always has an East/West theme (Chef Masaharu Morimoto’s restaurant anchors the hotel); 15 chefs, nine wineries and five mixologists will be featured. 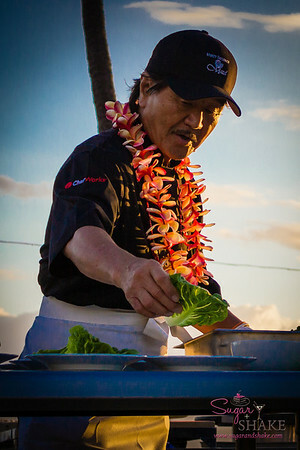 Hawai‘i Food & Wine really pulls in the big name chefs; if you’re a celebrity chef stalker, these events are worth checking out — just like the winemakers at the Kapalua Wine & Food Festival, the chefs are pretty stoked about being in Hawai‘i and are quite happy to pose for photos and chat with people. Oh, and they make some pretty decent food, too. Course One: Chef Marcel Vignernon (known for his appearances on Top Chef; Modern Global Tasting, Inc.) — Masago Fried North Shore Tilapia with Hearts of Palm Salad, Herbs, Hawaiian Chili Pepper Water, Citronella Oil & Thom Kha. This was an excellent dish with an amazing crispy-skin piece of tilapia; Shake picked this as his favorite because of the fantastic sauce and crispy skin. 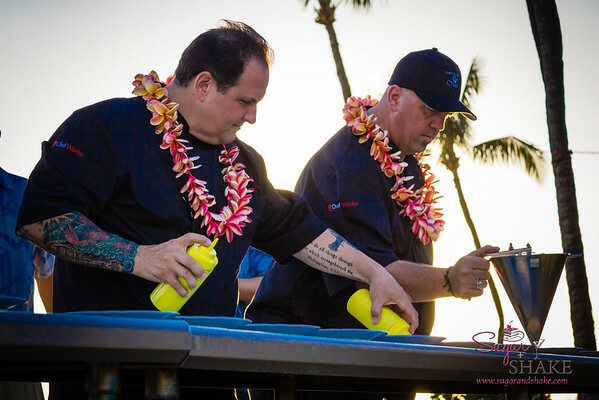 Course Two: Chef Greg Grohowski (pictured below, right; Hyatt Regency Maui) — Big Island Kampachi with Pickled Maui Onion Jasmine Risotto, Lavender Sea Urchin Cream, Poha Berry Gastrique & Hawaiian Ogo. The fish was good, but I probably would have been happy if a bowl of this risotto was plonked down in front of me with a healthy dollop of the lavender-uni cream. @Melissa808 messaged me and said she would be happy to come over from her table to lick up any sauce I wasn’t going to eat. Course Three: Chef Rick Tramonto (pictured above, left; Tramonto Steak & Seafood) — Hawaiian Shrimp & Corn Cappuccino with Mango Ceviche & Coconut Crema. I really liked this refreshing dish; it was light and just the right amount of creamy and tangy. It also came plated with little quotes concerning food. 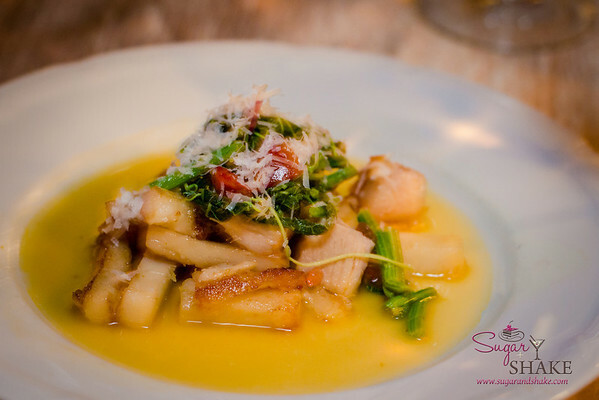 The one I got said, “Food is our common ground, a universal experience.” – James Beard. Shake got “One cannot think well, love well, sleep well, if one has not dined well.” – Virginia Woolfe. Course Five: Chef Hiroyuki Sakai (famous in America, of course, because of Iron Chef; La Rochelle) — Roasted Beef with Fried Pate Brick and Wrapped Vegetables in Miso Sauce. Honestly, I was expecting something more dramatic from the Iron Chef, but this was an exceptionally tender piece of beef with an incredibly flavorful sauce. We couldn’t figure out the “Fried Pate Brick” part, but someone told us later that the pate was the wrapper around the vegetables. If this has whetted your appetite, there are still tickets available to the various events happening the rest of this week. They’re not cheap by any means, but as I said in my post on Vintage Cave, if you value food as an art form and the experience of tasting the work of these talented chefs is something that excites you, this is a unique experience. I’m sure I’ll never get to go to most of these restaurants and it’s clear that the chefs are having fun being here and playing with their food. I agree with you on the Iron Chef dish! 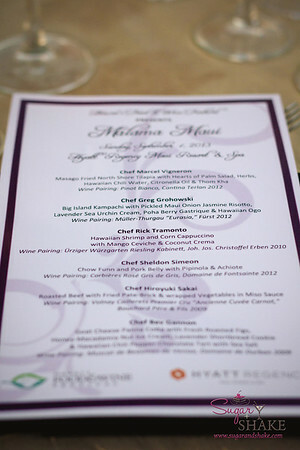 Also did you know that the chefs only plated 75, and the rest were done by the students? That’s why they looked inconsistent! That explains that! We should compare more dish photos!